Just coming into its own as a science, evo-devo is the combined study of evolution and development, the process by which a nubbin of a fertilized egg transforms into a full-fledged adult. And what these scientists are finding is that development, a process that has for more than half a century been largely ignored in the study of evolution, appears to have been one of the major forces shaping the history of life on earth. 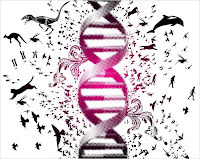 From a few genes, life's myriad shapes and Darwin still rules, but some biologists dream of a paradigm shift, where the latter talks about possible future directions of evolutionary studies, including evo-devo. If you don't have time to read these and like pretty pictures, here is a very nice 5-minute video introduction to evo-devo - especially check out the bit on icefish.